2 Hours of the biggest names in active and alternative rock, along with exclusive interviews! Heard in over 110 markets, hardDrive has been on the air for over 20 years! Hosted by rock radio's most popular and respected talent, Lou Brutus, the show brings listeners two solid hours of cutting edge new rock music and exclusive interviews with the biggest rock stars. Listeners can interact with hardDrive by email (via the link at harddriveradio.com) and call-in requests (877-MUSIC-11) and via social media at hardDriveRadio on Facebook, Twitter, Instagram and the hardDriveRadio APP. Each week, along with 4 major artist interviews, we help listeners discover new music with an interview a brand new band in PLUGGED IN and play a brand new song in "What's In Lou's mp3 Player?" Ask Lzzy features Lzzy Hale of the Grammy-nominated Halestorm who answers listener questions. The latest music news and info is brought to you in DIRT. hardDrive plays the most new rock in two hours than any syndicated show on the air! 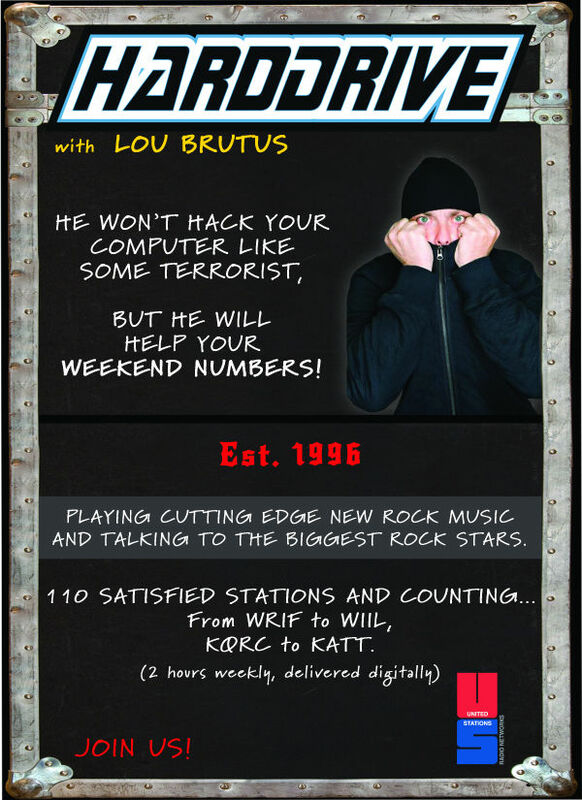 And we are America's longest running new rock syndicated show hosted by the award winning air talent, Lou Brutus!